Want an awesome alternative to sledding? Try tubing at Blackwell Forest Preserve (Mount Hoy) in Warrenville. It is so fun that we have gone on both Saturday and Sunday! 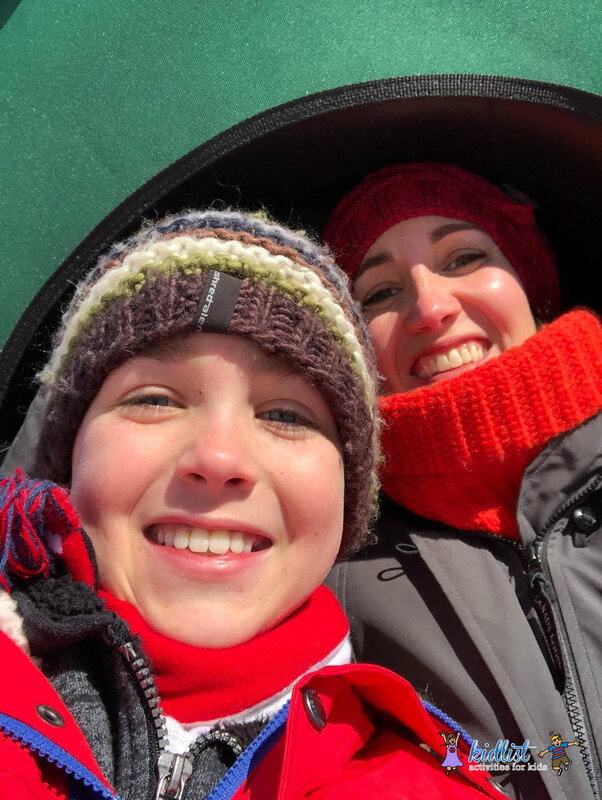 The tubing hill has two branches and is 800 feet long. It open for rentals and tubing when there are 3 or more inches of snow covering the hill. Kids and adults of all ages are welcome to go tubing! It is recommended that kids under 7 years old ride with an adult and one adult may go with one child. Children 7 years old and up may ride with an adult or by themselves. The Mount Hoy rental area is open 9:00 am – 4:00 pm on weekends now through February 24, 2019 plus January 18, Martin Luther King Jr. Day (January 21), and President’s Day (February 18). Inner tube rentals are $10 per day and end at 3:30 pm. Only district rented tubes are permitted. We rented one tube between the four of us so we could watch each other go down the hill, which was really fun and entertaining, but when we went back we rented one tube for each adult so there was no waiting between runs. If you have older children (tweens/teens) that are comfortable carrying the tube, then they can get their own tube too! The walk up Mount Hoy is on the steep side, but completely doable. There are sections of metal mesh to help your boots grip the path as you ascend. The tubes need to be carried all the way up so they continue to be in great shape for everyone. After carrying the tubs on the side (pictured above), we found that carrying the tube on your head while holding the handles is the easiest. The view from the top is nice, so be sure to check it out! There’s a fire pit with benches at the base of the hill, so take advantage of it! It is surprisingly warm to sit around the fire, even amidst all the snow. We recommend renting the covered nylon tubes as opposed to the regular tubes. Covered tubes have a bottom on them and travel down the hill better than the conventional tubes. 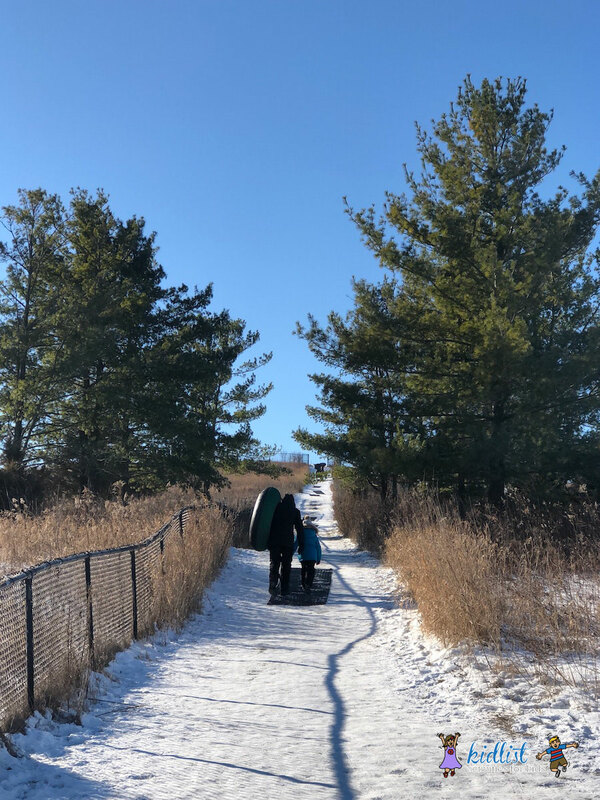 The RFAs (Recreational Facility Attendants / Forest Preserve Employees) told us that the regular tubes have been known to get stuck halfway down and/or not slide down the hill as fast. Carry the tube over your head or rest it on your head as you walk up. It’s easier and less taxing than carrying it by the handles on either side of you. My 10 year old son and I rode down together with him sitting between my legs (with both of our legs over the front of the tube) and we went fast. However, when part of your body is resting on the fabric bottom of the tube, it creates more friction and slows you down. If you want to increase the thrill level, you can either lift your bottom if you are going down on your back, or ride head first (on your stomach) to go faster. Wear scarves or something to cover your face. As your tube picks up speed, so does the wind against your face. Unfortunately we don’t have ski goggles or masks, but wearing hats and putting a scarf around the lower parts of our faces definitely helped. There are RFAs in the office, at the top of the hill, and at the bottom. They are so friendly and there to answer questions, help and/or give tips! To give you an idea of where you are headed, pictured below is the south end of Blackwell Forest Preserve. 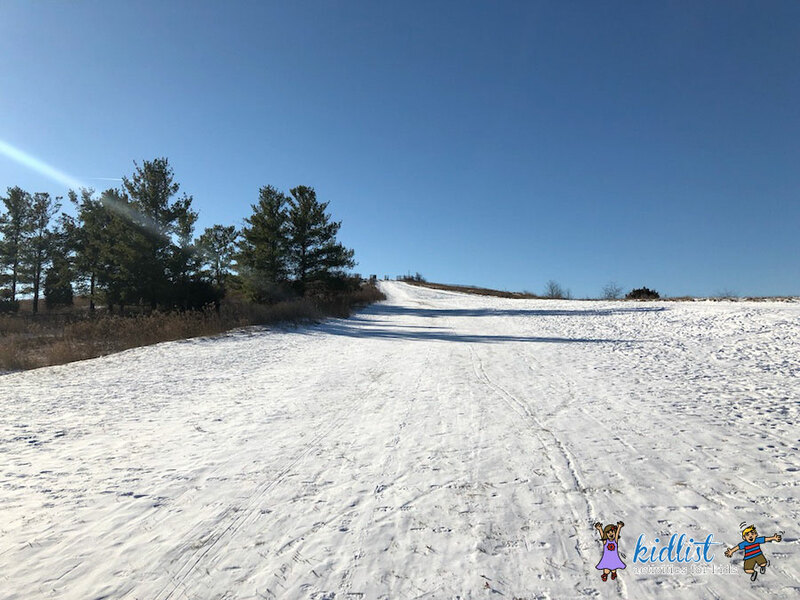 Click here for local sledding hill options! Rentals are $10 for two hours or $15 per day and are available when there’s ample snow on the trails. When Mount Hoy’s open, rentals are available at the base of the hill until 2:00 pm. On weekdays when Mount Hoy isn’t open, rentals are available 8:00 am – 2:00 pm at the west sector office on Mack Road. Call (630) 876-5931 for availability. You can also rent daily 10:00 am – 2:00 pm at Fullersburg Woods Nature Education Center in Oak Brook. Call (630) 850-8110 for availability. For fans of cross-country skiing, rangers groom more than 70 miles of trails at forest preserves such as Blackwell in Warrenville, Fullersburg Woods in Oak Brook, Danada and Herrick Lake in Wheaton, Greene Valley and Springbrook Prairie in Naperville, Mallard Lake in Hanover Park, Meacham Grove in Bloomingdale, Waterfall Glen in Darien and West DuPage Woods in West Chicago. If you aren’t a classic skier, use the inside of the trails to avoid damaging the set tracks. 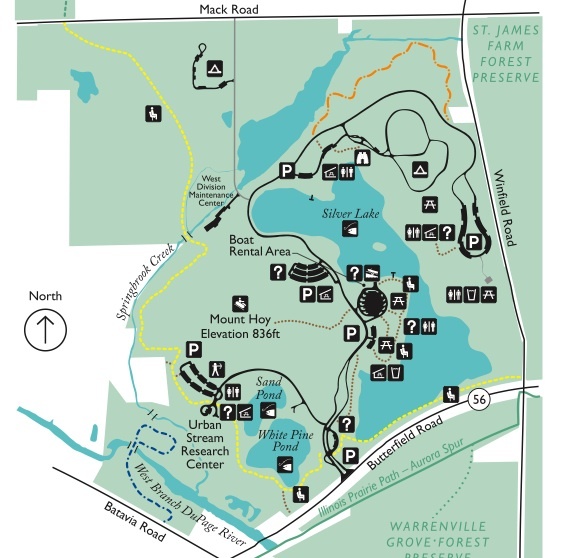 Ice fishing, ice skating and sledding are allowed at most forest preserves, although never at Spring Creek Reservoir in Bloomingdale. Additionally, sledding is not allowed at Mount Hoy at Blackwell or at the closed landfill sites at Greene Valley and Mallard Lake. The District does not monitor ice conditions, so visitors go on ice at their own risk. As a guideline not a guarantee, there should be at least 4 inches of clear ice for any activity. Anglers can find complete regulations in the online fishing guide. Looking for more opportunities to go sledding? Head over to our Guide for Where to Sled! When there’s adequate snow conditions, mushers can dog sled on the Thunderbird Spur Trail at Greene Valley and on the West Branch Regional, Bobolink and connector trails north of Mack Road at the McKee Marsh area of Blackwell. 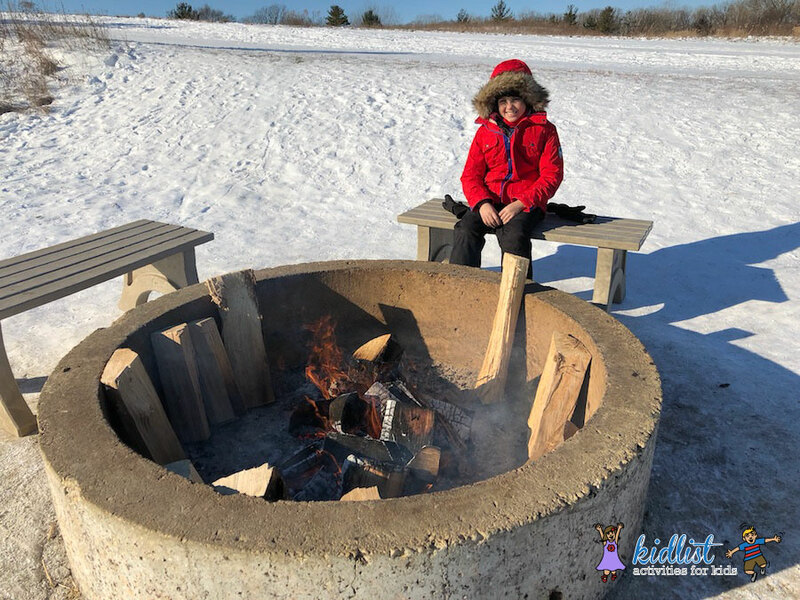 Click here for more Local Winter Fun! 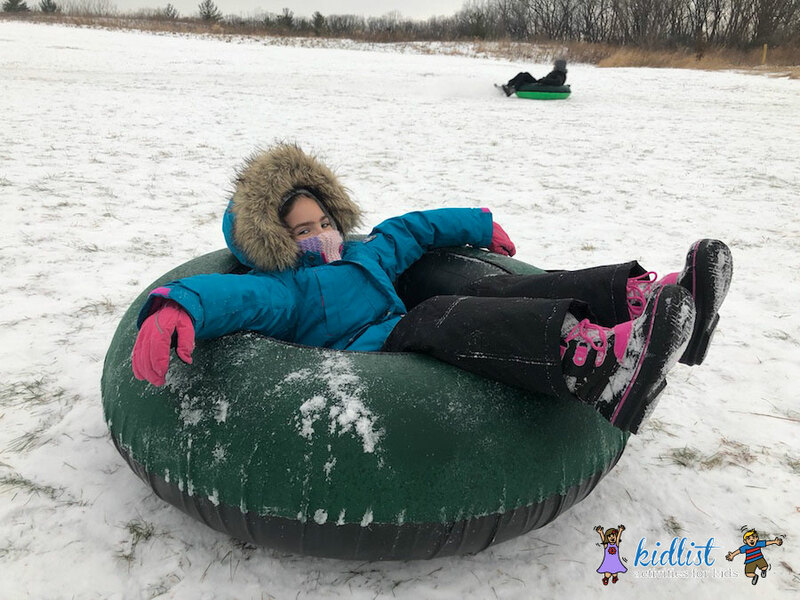 Be the first to comment on "Tubing at Blackwell Forest Preserve: Mount Hoy"